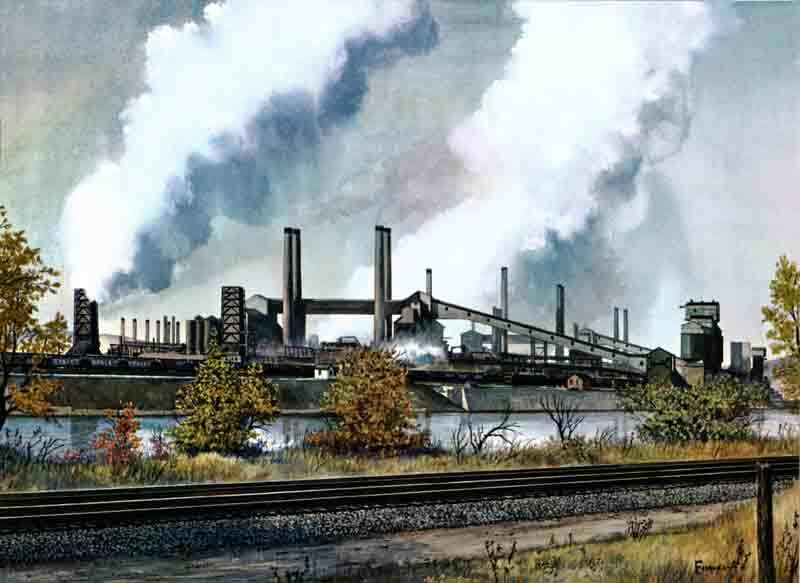 Clairton Coke Works circa 1950 by Howard Fogg. Print available from Coalingstation.com - click the picture for a larger view. But would you ever think that as late as 1972 it was still made like this? The 200 ovens in Shoaf were still profitable when they were shut down due to air pollution laws in 1972. The trend for several decades however had been to move coke production to larger plants closer to where steel was being made. Those large coke batteries were more efficient and were able to extract valuable chemicals and gasses which were impossible to collect using the older beehive style ovens. Coke ovens at Shoaf with larry cars on top. The larry cars carried the coal from the mine, the cars then were emptied by dropping the coal through an opening in the roof of the oven. The coal was fired and then after about 72 hours became coke. Next water was sprayed into the oven to cool the coke down enough for it to be removed through the arched openings on the side. Then finally the coke was put in railroad cars for transportation to the steel mill. What do the Shoaf ovens look like today? Coal and Coke Heritage Center, Penn State Fayette Eberly Campus – A terrific site which is dedicated to coal mining and coke making. I would check out this site first for a general overview of the processes and culture which grew up around these industries. You will find several references to the Shoaf works there. Manufacture of Coke at Salem No. 1 Mine Coke Works – Although this link is not related to the Shoaf complex, it is the the best description of the coke making process that I could find. Very interesting and easy to understand. Good illustrations. Shoaf Cokeworks in Operation – Here you will find blueprints of how the coke ovens were designed, old photographs of the Shoaf Coke works in action and a memorial page. Be sure check out the links at the bottom of the page. SWPA Rural Exploration – More pictures of what the Shoaf ovens look like today. Coalcampusa.com, Shoaf PA – plenty of pictures of the mine, company town, coke works along with a great description of what it was like to live and work in Shoaf. Hope to make a trip this summer to photograph the ovens at Belle Vernon, Shoaf and some really cool ones down near Penncraft PA. Let me know if any of you would like to go along. It would make a fun day trip!